Specially designed to help your little one develop grown­up drinking skills. Super soft straw makes drinking easy and is gentle on gums. Straw flips down between sips to stay clean and stop spills. Removable, easy-grip handles help little hands grip the cup securely. 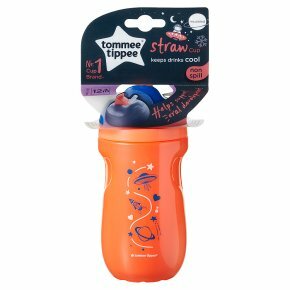 All Tommee Tippee cups are BPA free.When your little one is ready for more than a dinner­time sip, this Trainer Straw Cup, which holds up to 230ml, comes in handy. The soft silicone straw is really easy to drink through, so little hands don't have to tip the cup so far to drink from it. The straw flips down to stay clean and prevent spills - handy when you're out and about or want to avoid mess at home. The soft straw on this cup is smooth and gentle on gums, even when your baby is teething. We're gentle on you too: all our cups are dishwasher safe (on the top shelf), can be sterilised in the microwave, and have interchangeable parts. Straws are not suitable for a child under 6 months.